Acquaye Dental Family Dentistry (Garland) - Book Appointment Online! 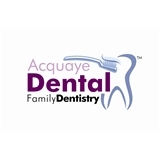 Welcome to Acquaye Dental Here at Acquaye Family Dentist, we believe that the dentist and patient becomes a team for treating an individual's dental needs. The dentist spends most of her time listening to understand your concerns and responding with the best and latest treatment options for you. We also follow up to make sure that general pain is relieved, problems are resolved and your health improves. We are here for you! We also want our patients to be informed about dental problems and preventative treatments, because informed patients make better decisions about their health and well being.